The Central Bureau of Investigation (CBI) First Information Report (FIR) names Irfan Siddiqui, son-in-law of Ahmed Patel, for bribing top Income Tax officials for hushing up the raids and huge money trail data seized from Sterling BioTech and Sandesara Group of companies. The FIR registered by CBI on August 30, 2017, names senior Income Tax officials Sunil Kumar Ojha IRS, Dr. Subhash Chandra IRS, Manas Shankar Ray IRS and Sterling Biotech Limited from Vadodara as accused under Prevention of Corruption Act. That the Vadodara based Sterling Biotech and Sandesara Group promoters Nitin Sandesara and brother Chetan Sandesara are close to Sonia Gandhi’s Political Secretary Ahmed Patel is well known. According to the 11 page FIR registered by CBI’s Anti-Corruption Unit in Delhi, the top Income Tax officers conducted raids on June 28, 2011 at Sterling BioTech and Sandesara Group of companies offices in Vadodara, Mumbai and Ooty and found incriminating evidences of tax evasion and several dairies of political, bureaucracy and top police officers payoffs and later hushed up the case accepting bribe from company promoters. The CBI FIR says, the dairies found by the Income Tax raid party reveal a lot of payoffs to many persons including accused Income Tax officers Sunil Kumar Ojha IRS, Dr. Subhash Chandra IRS, Manas Shankar Ray IRS, among others. The FIR accuses these officers and other unknown persons of hushing up the huge tax evasion by the Sterling BioTech and Sandesara Group of companies. That the Vadodara based Sterling Biotech and Sandesara Group promoters Nitin Sandesara and brother Chetan Sandesara are close to Sonia Gandhi’s Political Secretary Ahmed Patel is well known. When the raids were happening on June 28, 2011, within hours, the raiding party was asked to back off from the company premises, according to CBI officials. The page No: 7 of the FIR says diary entries say Ahmed Patel’s son-in-law Irfan Siddiqui known as Irfan Bhai paid Rs. One Crore to the accused Income Tax official Dr. Subhash Chandra IRS. “Information further revealed that the said Diary contained an entry for cash deposit of Rs. 75,00,000 in the name of Dr. Subhash Chandra IT on 25.02.2011 is found duly incorporated in the daily consolidated summary, seized from Vadodara by search Party No: 17. The receipt of Rs. 75,00,000/- from Dr. Subhash Chandra IT and a further sum of Rs. 1,00,00,000 from another person Mr. Irfan Bhai in cash which is also mentioned and added to total receipts. Further, payment of Rs.1,75,00,000 is also shown in the entries under “Vadodara” as “SHOKEEN PROP” (Delhi Farm House). Similar entries are mentioned in Dairy 2011. A sum of Rs. 30,00,000 is shown as cash received on 02.04.2011 from Dr. Subhash Chandra IT by Mr. Gagan Dhawan and the same is given to Mr. Shokeen (Shokeen Properties P Ltd) by Mr. Gagan Dhawan,” says the FIR, saying further investigations are going on in this regard. Irfan Siddiqui known as Irfan Bhai is married to Mumtaz Patel, daughter of Ahmed Patel. CBI which registered FIR started calling many persons involved in the payoffs and Irfan is expected to be summoned soon. The FIR also accuses the Income Tax officials of not taking a statement from Ajay Panchal, who maintained these diaries in 2011 (called Diary 2011), which is having many top political, bureaucratic and senior police officials from Gujarat in the payroll of Sterling BioTech and Sandesara Group of companies. In coming days this case is going to be a sensitive issue, when the CBI started calling heavyweights named in the Diary 2011, seized from Sterling BioTech and Sandesara Group of companies in June 2011. Allegations are already on air that many names in the Diary 2011 are already hushed-up. This is pure political vindetta and all award wapasi gang which is waiting will come out with full force to defend Irfan. So in your opinion these misdeeds of bribing on massive scale should be overlooked / bypassed / hushed up lest they be considered “political vendetta” just like what the IRS officials did? Your logic is so sound !!! Long live Indian politicians, congress variety, their Bhaktas and their relatives! 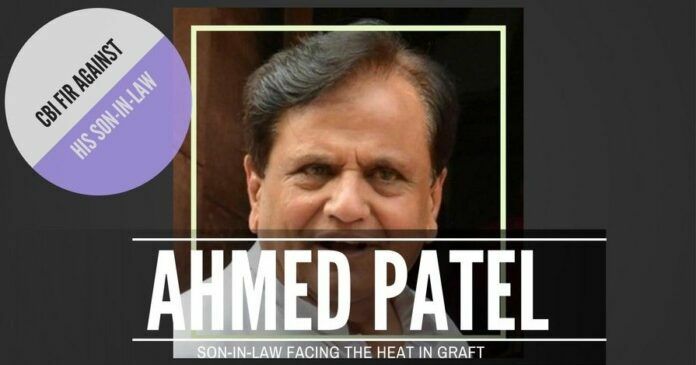 Ahmed Patel is now caught. Thing is you will obtain more credibility when you expose the connections of Ambani & Adani. Such a dirty world out there. Thank you for reminding me of the Adani posting. Was any follow up done? Guess handing out Padma Vibhushans to Dhirubhai & Pawar set an example for all Indians to follow and emulate. Try bringing to light the corrupt. Keep your own gateway/ entry door clean before expecting others to do so. You have no idea of what I have done or the failure of connected persons. Guess with people like you who have views like yours are what is needed by this site. Goodbye. Am not here for arguments.